Over the past year, many people have asked me what a book wheel is. While I have a page that will tell you all of the information outlined below, I wanted to share it with those of you who might not know! The Book Wheel was invented in 1588 by an Italian engineer by the name of Agostino Ramelli. The design of the wheel allowed for the readers to rotate through heavy volumes without needing to get up from their seat or lug them around. 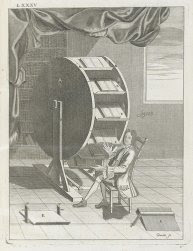 Because it allowed the books to be accessible at any angle, it is considered an early prototype of hypertext and is hailed as one of the first “information retrieval” devices. Why name a blog after it? I named my blog The Book Wheel for so many reasons! Wheels never end and revolve. My love for books is constant, never ending and my entire world revolves around books. Or, you could say that books make the world go ’round. Or that books make my world go ’round. Or that the wheel of invention is dependent on books. Or that books propel us forward. Or that knowledge depends on a never ending supply of information. Or that books provide never ending knowledge. Or that the supply of books is never ending. Like I said, there are a lot of reasons! Are there any modern day book wheels? Yes! Click through the gallery to see Book Wheels in action!